We don’t eat fried foods that often, but every once in a while I get a craving for something crispy and crunchy. 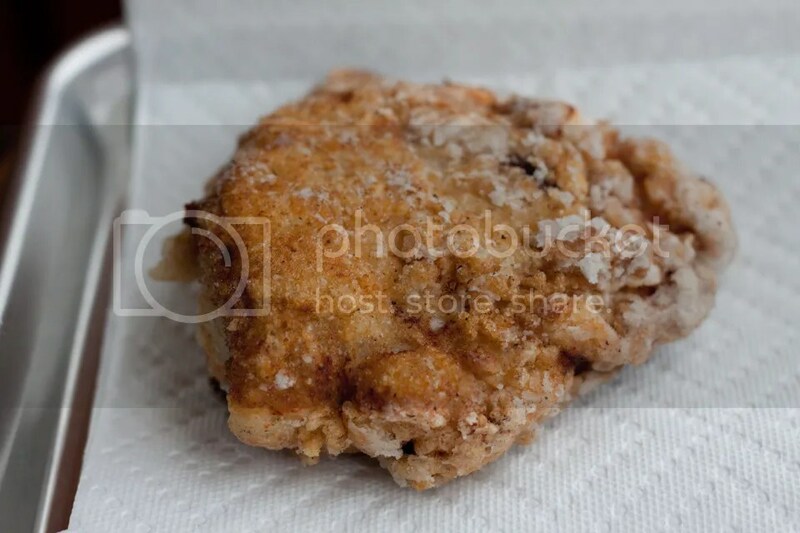 So I set out to make a gluten-free, Paleo-friendly Southern Fried Chicken. Bear in mind that this isn’t a smart choice for your everyday meals, but it’s a great way to change things up every once in a while. The creation of Southern Fried Chicken is the result of several different influences: fried chicken was a West African delicacy brought over to the US by slaves, the mass-production of pork in the South made lard readily available, and the popularity of cast iron cookware in the 19th century created the fried chicken we now associate with the South. I kept my recipe true to those historical precedents, including the use of buttermilk as a marinade. If you’re dairy-free, omitting the buttermilk marinade will still leave you with a pretty tasty fried chicken. 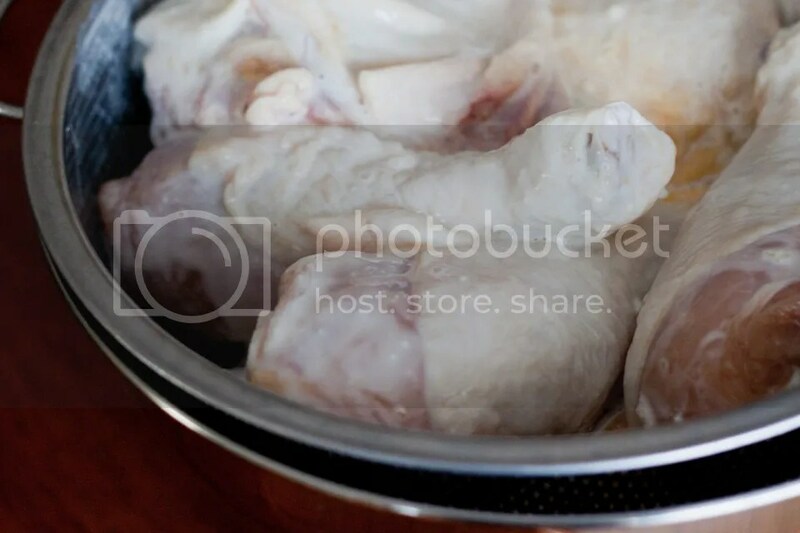 Gently rinse the chicken parts with cold water, and pat dry with paper towels. Place the pieces in a gallon-sized resealable plastic bag, and add the buttermilk. Put the bag in the fridge and marinate overnight. The next day, place the pieces in a colander and allow them to drain for 20 minutes. Move the pieces around every few minutes so they properly drain. This process will help bring the pieces to room temperature, which is a crucial part of getting this dish right. Meanwhile, warm the lard in a cast iron skillet on medium heat for about 10 minutes. In a shallow pan, mix the potato starch, salt, paprika, and black pepper. Coat the chicken pieces with the potato starch mixture, then place them in the skillet. You only need to coat the pieces that you’re going to fry immediately. Fry the pieces for ten minutes on one side, reducing the heat if the lard starts to smoke. Flip the pieces over and fry for another ten minutes. The internal temperature should be around 165 degrees. Preheat your oven to 200 degrees. Drain the chicken pieces on paper towels for a few minutes, then place them in the oven (on a cooling rack if you have one, otherwise a plate or cookie sheet is fine) while you fry the rest of the pieces. Before adding new chicken pieces, check your lard and add more as needed. That’s it! Season with a little salt and pepper right before serving, if you’d like. 2-3 cups of lard!!! i love it! What about goose fat? One slow roasted goose gives me lots of fat, and keeps a long time! I’ve been seeing a lot of gluten-free food… but fried chicken is a first! looks delicious… I’ll have to share this with my friend who’s gluten intolerance! Oh man, these look awesome, but I definitely don’t have that much lard lying around, hahaha!! Thanks Alex! Yeah, this is definitely a lard hogging (pun intended) recipe. Nice new avatar! Dumb question…where do I get lard? I’ve seen it in stores but it always has the dreaded word “hydrogenated” on it. Hey Eric, you probably won’t be able to find non-hydrogenated lard in a grocery store (maybe in a latin market, but that’s a stretch). Your best bet will be directly from a pork farmer, or from a butcher/meat supplier. You want to look for the stuff that’s either frozen or refrigerated, since that typically means that it’s pure and non-hydrogenated! Hi Shelba, unfortunately, for this recipe you’ll need an added cooking fat. With Michelle Tam’s cracklin chicken, she de-bones the chicken to speed up the cooking process, and still adds ghee to the skillet to start the cooking process. For this recipe, the added fat is necessary to reach halfway up the chicken, and since the chicken is bone-in, it requires a longer cooking time to cook through to the bone. Hope that makes sense! Oh man, if I hadn’t stopped eating chicken… but I bet this works with chicken fried steak! Totally curious here, what is not so great for us about fried food if the oil is a stable fat such as pastured lard, and the food itself – potato starch and chicken is fairly benign? My understanding on deep frying is that if the temp is hot enough, at least 375 degrees, the heat will immediately seal in the coating and oil will not be soaked into the final product being fried, so one isn’t really eating more oil then if the food was say, sauteed. There are a couple reasons why we don’t fry food often. #1 is that it takes a lot of oil! :) I’m a bit of a cheapskate in that sense. Secondly, I’ve seen some people say that fried food from healthy animal fats are fine, and others have said that they’re no good. I’m not smart enough to know who to believe! There have been some studies where two groups of people were fed the same diet, with one group eating their food fried, and that group showed higher instances of insulin resistance. I think it’s a relatively uncharted avenue, and I’m not sure if saturated fats from healthy animals would reduce this phenomenon. Matt Lalonde talks about this a little in this podcast – http://livinlavidalowcarb.com/blog/ask-the-low-carb-experts-episode-9-all-things-calories-calories-101-mat-lalonde/13615 (about 35 minutes in). BAM! I know what I’m taking to the dinner party tomorrow. Wait, what dinner party tomorrow? I saw no invite. Let me know how it turns out! Lard (the pure, non-hydrogenated type) is definitely hard to find, you either have to get it from a butcher or farm, or render it yourself using pork fat (which isn’t as hard as it sounds). It’s a very stable cooking oil, and surprisingly good for you, especially when taken from healthy, pastured pigs! domesticman! excellent blog filled with epicurean recipes that would adorn a bacchanalian feast! For deep frying, I use Palm Oil shortening as it is more readily available than the lard, and also needs no refrigeration!. This place sells a bigger tub than the spectrum organics and it is cheaper on a per serving basis. I have used the product and it is like Crisco but without the nasty soybean oil and hydrogenated trans fat!. When I deep fry french fries with the stuff, it reminds me of the taste of the McDonald\’s fries of old, when they used the famous blend of beef tallow and cottenseed oil. Now, if anybody can tell me where to find beef tallow for deep frying, I would be in heaven, nirvana, or valhalla…take your pick! I agree, palo oil shortening is delicious. 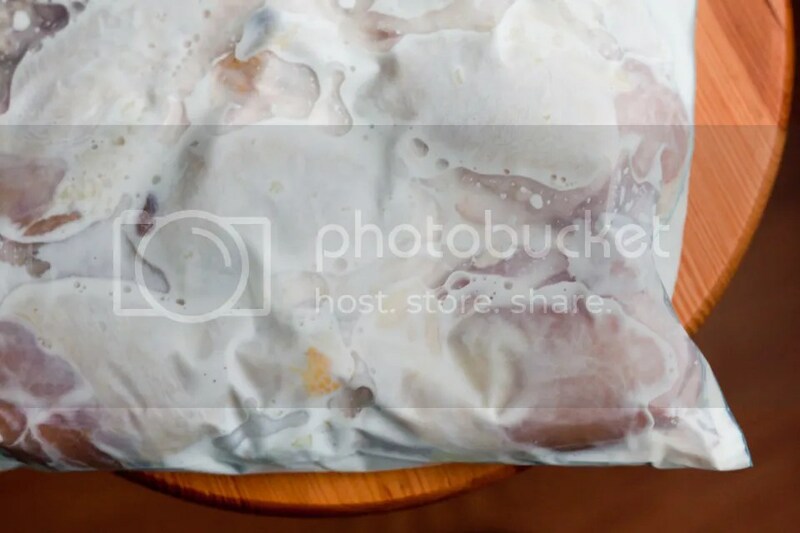 For tallow, I’ve always just asked local meat markets to set aside the fat they trim off cuts, which they usually do for free, and then render it myself: https://thedomesticman.com/2011/01/18/how-to-render-tallow-beef-fat/ Hope that helps! Use coconut oil instead. You can buy it without the taste and it is great for your health and will heat to very high temperatures without smoking. I recently switch to coconut oil for most things I use oil for. It is great and handles high heat! It is a bit odd (comes in a solid white form in a jar) and takes some getting use to. My father is on a gluten free diet. He grew up with fried foods, but doesn’t get them very often, so I am going to give this fried chicken recipe a try! An excellent gluten free version! I grew up in the South and I must say your recipe is spot on, including the lard. Just an fyi, Spectrum organics now makes a palm oil lard that works beautifully. thanks for posting! So does your fried chicken! Making it this weekend. Thanks! Hi Marie, modern Crisco is a blend of soybean oil, fully hydrogenated cottonseed oil, and partially hydrogenated soybean and cottonseed oils; all of which are high in Omega-6 fatty acids and likely an underlying cause of the increased inflammation and heart disease found in the Western world over the past century. I would highly recommend using something that can be found in a less-processed state like saturated animal fats from healthy animals (lard, tallow), or virgin oils like coconut or palm oil. is that 200 C or F? …. just to keep warm? Yep, 200F to keep the chicken warm as you cook the rest of it! Also letting it sit in a warm oven for at least five minutes gives the chicken a chance to rest a little. I love it! Had to “pin” it! 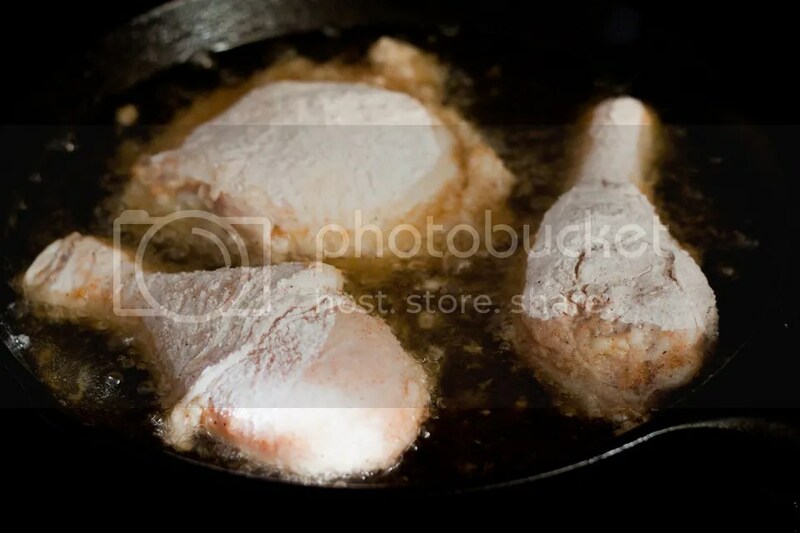 I am preparing this chicken for my 92 year old mother who is gluten intolerant for the 4th of July because this is what she grew up having…I forgot to get Crisco or lard so I’m using liquid vegetable oil and a little tiny bit of butter…am eager to see how it comes out…I expect it will be very good. I used Kinnikinnick All Purpose Mix, didn’t have black pepper so I used a pinch of cayenne. Thanks for posting this recipe, I had no idea where to start. Thanks Kathy, I hope it turned out okay! Soo excited to try this, I’ve never made fried chicken before! I don’t have lard, but do have some duckfat and pastured butter at home that I’ll use instead. Would you mind if I wrote about it on my blog and linked to yours? Sheila, I would be wary of trying to fry the chicken in butter, it will probably burn at that high of a temperature. Duck fat would be excellent though! Others have told me that coconut oil worked okay as well. You’re most welcome to write about this recipe on your blog! Pingback: Gluten-Free Southern Fried Chicken | All things considered yummy! My husband has been looking for a gluten-free fried chicken to make to replace his former specialty… LOVE that this one is from another guy :) Thanks!! Made this tonight for dinner….Oh My Gosh….. YUMMY!!!! I have’nt had fried chicken in so-so- long. Did’nt have enough potato starch needed 1/2 cup more, so I used almond meal to the potato starch for the equal the amount needed for frying. Really came out “Delicioso” I did’nt stop there… just had to make homemade chicken gravy! for the mashed potatoe’s or biscuit’s :) soooo good! Talk about fattening, but was worth it, I never get to go all out, so I did! The family kept going on and on about the nice crunchy flavor of the chicken. Thanks for the story! Glad to hear you guys enjoyed it. Question? How did you make your gravy? I just started to Marinate the chicken, I am very very excited to try this recipe tomorrow. I will let you know how my friends, and boo like it!! Patty, looking forward to hearing your results! Be sure to cook it at a slightly lower temperature than you’d normally fry things – the potato starch has a tendency to brown faster than a regular flour coating. Deana, happy to be of service! I just wanted to say THANK YOU, I’ve haven’t had fried chicken in such a long time. It was extremely good, thanks for the tip about keeping it at a lower temp. I put some hot sauce on half of them, which turned out amazing. Thank you soo soo much for this recipe, I am going to try a few more!! We live in a vegetarian home but you inspired me to make fried tofu with a potato flour crust. Yum! Made this for a family gathering tonight and it was a hit. Tasted just like southern fried chicken. Used boneless chicken breast and ended up finishing them in the oven on the wire rack at 350 degrees for 10 more minutes. The buttermilk marinade made the chicken extremely juicy. Thanks for this recipe. This looks fantastic!!! Do you know if there is a dairy free alternative to buttermilk? And I am thinking of using coconut oil instead of lard – all my southern friends say its the best AND it’s an plus with Omega3s.. Thoughts? Those who are looking for a cheap source for fresh lard can find it easily at a Latino market. It is normally rendered daily at my market. April, thanks for the tip. How about bacon fat. My mom always saved up the drippings for fried chicken. If pastured pork…why not? Can I use coconut oil in place of the lard? Any substitute for the potato startch? Coconut or Almond flour? I have used coconut flour and coconut oil for chicken nuggets in the past and it turned out fine, but it would definitely change the taste. 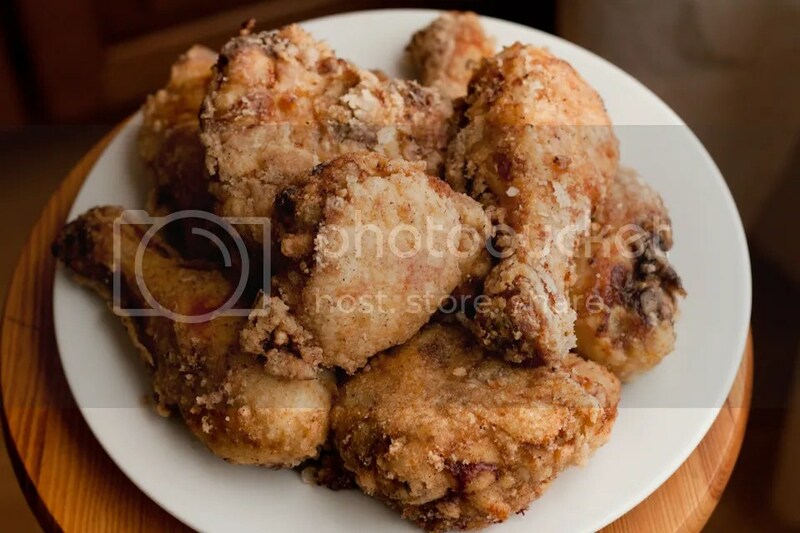 The potato starch and palm oil/lard, gives the southern fried chicken an authentic flavor. 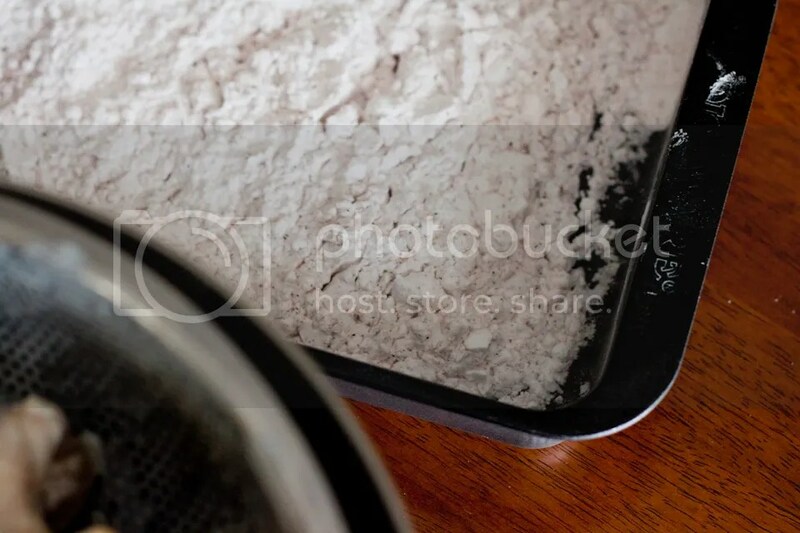 If it’s the potato content you’re concerned with (and not the fact that it’s a starch), a combination of arrowroot and tapioca would be okay as well. Like jaschewe said, you can definitely use coconut oil and a nut flour but the taste will be altered. How do you dispose of your cooking grease? It depends on the fat – some can be strained and reused (lard and duck fat especially). For the stuff we’re going to discard, we pour it into a glass jar to cool overnight, then spoon it into a plastic grocery back, tie it up tightly and toss it out with the trash. We don’t have local recycling for it, as far as I know. I’ve heard of people pouring it in with old litter to absorb it. What if you mixed corn starch in with the potato starch? Would it taste strange? Would it brown faster or slower? I would think the corn starch would help the batter stick?